Have a hot air balloon all to yourself and a private party of up to five adults. Celebrate a special occasion and be treated with first-class service while a scenic balloon flight takes you over the Sonoran Desert from Phoenix at sunrise. Then toast your 1-hour aerial tour with traditional post-flight Champagne and gourmet hors d'oeuvres. Thirty minutes before sunrise, meet your guide at a central location in Phoenix. Grab the chance to purchase coffee (own expense) before boarding your off-road hot air balloon 'chase vehicle' to the launch site — the location will be determined by current wind conditions. Take in the the beauty of the Sonoran Desert while the hot air balloon is inflated and prepared for your private launch. You'll soar into the wild blue for about 1 hour. During this time, learn from your personal pilot-guide about Arizona history and the area's wildlife, including more than 1,000 species of flora and fauna. At altitude, look down at downtown Phoenix and hear tales of the local lifestyle. 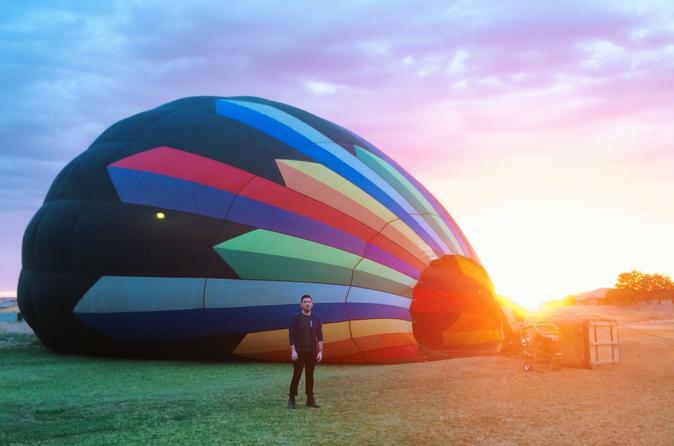 Just before landing the balloon, cast your gaze over the landscape against a vivid Sonoran Desert sunrise while you float above McDowell Mountain Regional Park, Camelback Mountain, and the surrounding Phoenix metro valley. After landing and while the light continues to spread over the mountains, your guide will pull out picnic baskets and tables for a Champagne toast and gourmet hors d'oeuvres. Once the crew has packed up the balloon and you have enjoyed this age-old tradition with your private party, you will be taken back to your meeting point.